Ever since it was founded, Hamilton has been making the finest, and best quality watches to their customers. This is a famous watch brands that is well known for their elegant and classy watches. Today, it offers timepieces that range across all sorts of styles from vintage to modern chronographic watches. While some of their high end watches are a bit expensive, they have a great collection of watches which come at very accessible prices. Are Hamilton watches good? Below are Hamilton watch reviews of five bestselling Hamilton watches which you should definitely check out if you plan on getting yourself a great watch. The Hamilton Men’s HML-H70455533 Khaki Field Black Dial Watch is a watch that you would want to wear with a pair of chinos and a Polo T-Shirt. It is the kind of watch one would wear while chilling out beside the pool sipping on some ice tea. The diameter of the case is 38mm while the thickness is 11mm. This watch is the perfect mixture of classiness and elegance. And it has an overall easy going and casual appearance. The combination of brown colored leather band and the black dial gives this watch an expensive and aesthetic look. 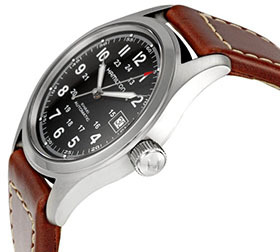 The stainless steel case is nicely complemented by the leather bracelet which also features contrast stitching. 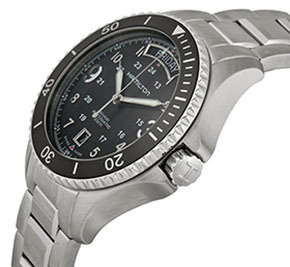 The watch features a fixed stainless steel bezel which looks pretty great. It is powered by an automatic movement, so you never need replace batteries. Also featured in the dial are the classic luminous hands and Arabic hour markers which go along very well with the style of this watch. And it is very easy to read time. There are minute markers, a date display at 3’O Clock and a GTM scale on the inner ring of the dial. And there is a sapphire crystal which is highly durable and protects the watch from scratches. It is also water resistant to 100M, this ensures the watch stays dry from moisture even when you’re swimming. 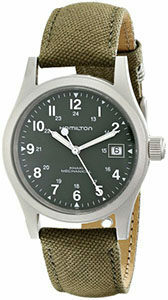 The Hamilton Men’s HML-H69419363 Khaki Field Green Strap Watch is for all the no-nonsense, rugged men out there who like to keep it straightforward and masculine. This is the kind of watch you would wear while out hiking in the hills with your buddies. A plain T-Shirt and some army camos would look just perfect with this watch. This watch belongs to the Signature Khaki Series of Hamilton which can range from rugged looking watches to very casual and laid back designs. Although the design of this watch is relatively straightforward and plain, yet it has an air of sophistication and masculinity. The watch features a stainless steel case which is not only visually appealing but also pretty sturdy and durable. The canvas strap which is olive colored looks pretty nice and gives off a rugged and robust look to it. 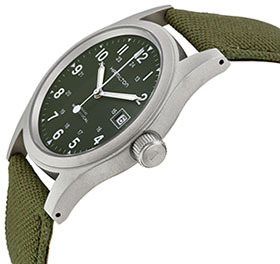 Additional, a fixed stainless steel bezel is also featured along with a green dial which is very Army-ish and straight up cool looking. The Watch has hour markers in Arabic numerals which are the classic style that goes along well with this watch. The hands and markers are all luminescent,so it is very easy to read time even in the dark. The watch also features a mechanical hand-wind movement, and there is a date window at 3’O Clock position. A GMT scale is also featured on the inner ring of this watch for added convenience. A scratch resistant crystal makes sure the watch keeps on looking new. Moreover it is water resistant to 50M. In general, it is suitable for short periods of recreational swimming, but not diving or snorkeling. 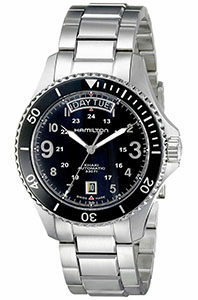 It is hard to believe that the Hamilton Men’s H64515133 Khaki Navy Scuba Auto Day and Date Watch is actually a diving watch. Because it looks so sophisticated and formal. This is definitely one of the most versatile watches that can go along with all kinds of looks. It takes versatility to a whole new level. You can rock this thing in your suit at the office and get tons of compliments from your colleagues. Or be at the bar in your usual casual clothes, and the watch will still look great as well. This watch features a screw down crown and an open case back which look pretty cool. Date display appears at the 6 o’clock position and day of the week displayed at the 12 o’clock position. It is powered by an automatic movement with about 38 hours of power reserve. The case diameter is 41mm which is suitable for most wrists. It is made out of stainless steel which not only looks great but is also durable and sturdy. The black color dial contrasts nicely with the stainless steel bracelet and gives the watch an elegant and sophisticated look. The scratch proof sapphire crystal makes sure this beauty is never flawed in case you accidentally bump it into a table. Additional, this watch comes with a 100M of water resistance. It ensures that your watch will stay from moisture even when you are swimming underwater. 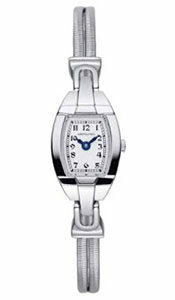 The Hamilton H42245151 Jazzmaster Ladies Automatic Watch is quite versatile and it can suit almost any type of attire. Be it a formal dress code that you are following a meeting at the office or a casual day out with friends, you can choose to wear this watch at both of the above situations. 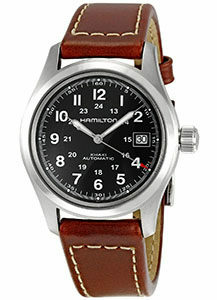 The watch features an automatic movement that is highly reliable coming from a brand like Hamilton. Ths case diameter is 30 mm and thickness is 10 mm. It is neither too big nor too small and will suit most wrists whether petite or large. 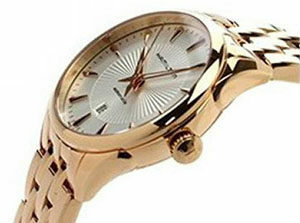 It also features a stainless steel band which has a rose gold finish and makes this watch look amazing. The rose gold colored band and the dial, which has a gray colored outer ring and an off white inner ring, complement each other brilliantly. Additional, the dial window is made of sapphire which is sturdy and very durable. And there is a date window at the 6 o’clock position. The hour markers and the hands are both colored rose gold making the watch look and feel very expensive. A water resistance of 50M makes sure the watch is safe from moisture. The watch looks absolutely great and is a brilliant blend of classiness and elegance. It is perfect for all the strong, independent women of today. A watch like this on your wrists exhibit grace and success. So go right ahead and get yourself this classy looking watch. And we are sure it will fetch you a lot of compliments. 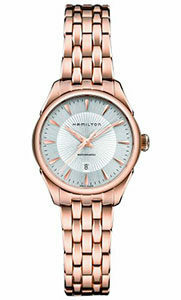 The Hamilton Women’s H31111183 Stainless White Dial Watch is a unique watch that looks highly fashionable and sophisticated. This is for all those women who like taking risks and are never afraid of a challenge. Bold and fashionable, these are the two words that would come into the minds of most people when they look at this watch. There are a few particular features that make this watch a highly appealing one. First, the slender stainless steel band which is only 5 mm in width and has a silver finish to it, makes the watch look unique and different from most watches that you see every day. Secondly, the white colored dial having blue hands looks pretty fresh and adds a touch of playfulness to this brilliantly classy and elegant watch. Apart from that, the watch features an anti-reflective sapphire crystal dial window which is highly durable and also scratch resistant. 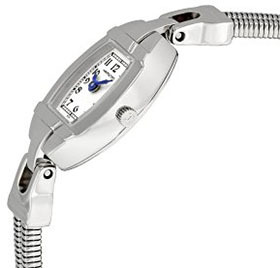 The band has a jewelry clasp closure, and it runs a highly reliable quartz movement. The small 14mm case is an absolute charm for all the ladies who have a petite wrist. It also features a stainless steel bezel and black hour markers which are in Arabic numerals. A water resistance of 30M protects the watch from any sort of spillage of water on it, but swimming is not recommended. In one word, if you like to dress a class apart from the crowd and prefer to have an air of sophistication in your attires, this watch is the best for you. Watches by Hamilton are always of top quality and look visually aesthetic. Investing in a great looking watch is a must if you want to add more elegance and confidence to your overall attire. The watches in this Hamilton watch reviews article give you an idea of what kind of a watch you should look to buy. They are not only good looking but are also very functional and highly durable. At a medium price range, they are among the best watches in the market that you can buy. So depending on what kind of watch you are looking for, get yourself one of these fantastic timepieces to add more class to your wrists.